Sift the flour and rub in the fat. Add the sugar and lemon rind. Add beaten egg,make into a dough, add some water if you think it is too dry. Put in cling film, and let it rest for an hour in the fridge. Add the ground almonds,75 g of the whole roasted almonds,almond essence, vanilla,the chopped glazed cherries,chocolate drops,and beaten eggs, and put in the fridge for later. Open the dough, and cover a greased 12 by10 dish, or a two 8 by 8 round shallow dishes. Leave to cool, and add the ricotta and almond mixture. Decorate with the remaining roasted almonds, and bake for 30 minutes at 180c until golden. 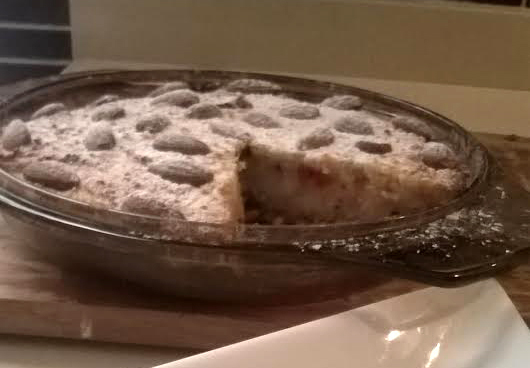 Did you enjoy this ground almonds and ricotta tart recipe? Have you tried it or will you be trying it? Let us know by commenting and rating and share so that we can continue to bring you the recipes that you'd want to see more of.